R-evolution is a 5-person racing game made in 8 days by the three members of mindful xp, a graduate student project exploring how meaningful games can be made. Its input is the Unitas Zero, a set of 5 pressure pads that individually are big enough for one person to stand on, acting as one big button. The game is split up into 5 vertical slices, with each player’s avatar represented at the bottom along a long track of land, and all of the avatars are started equidistant from one another, moving along the same track. The only interaction is that of players stepping on the pad, causing their avatar to go forward. The catch of the game is that there is no real race, and that to finish the game players must cooperate: when an player’s avatar hit another, the two go “in sync” and combine to evolve into a greater form. 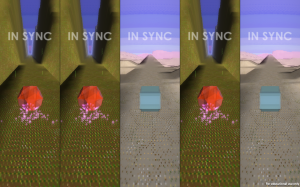 Players only stay in sync by moving forward in sync, otherwise they separate and become their previous forms. The goal of the game design then, is to get all five players to combine with one another, evolve into the final form (a giant “space bird”) and more forward in sync for a set amount of time. Then the game ends, the players having first competed, start cooperating one by one, and then cooperate all together. 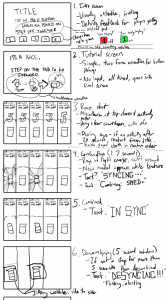 One of our "design documents"
Our project stemmed first from seeing an announcement of Experimental Gameplay Project’s 5 Button Competition. Our program prides itself on experimenting on very, very unique hardware platforms, and the competition’s Unitas Zero (the five button platform the competition was constrained to) seemed like a perfect fit for our skillsets. Limiting ourselves to making a five person, 1 button game was very welcome – it could mean that instead of worrying about technical considerations we could focus more on how well we worked as a team (as this was our first full project together, we wanted to test the waters). Plus the EGP’s usual standard of one game, one week fit perfectly with our rapid development aims. First we heavily considered what interactions the Unitas Zero was really capable of providing. For instance, you wouldn’t be able to cleanly do something like a running interaction with one person to one pad, since the pad is only a binary input, ON or OFF. If a person ran on the pad, there is a likelihood that at least one foot would always be pressing on the pad causing the input to always be set to ON. Having players discover that a game should go from competition to cooperation was intriguing to us (doubly so since the players would be discovering this as they played), and we quickly followed up with the idea of a racing game with a theme of evolution and changing forms. We spent eight days on the game, and here’s where we ended up! Playtesting: As soon as we had a playable build we got people in here to play it. Because our game was meant to be played by the general public in a party atmosphere, it needed to be incredibly easy to understand the game, especially when it came to the combination mechanic. Through early playtests we got a bit of a morale boost, since playtesters were very quick to grasp the concepts, but we were also able to improve many things early on. Subsequently we playtested twice more during our dev period, getting more and more feedback. Finishing: We finished our game and called it finished. While we could still work on it further, and the temptation was definitely there, because of the project’s pace this would mean putting off the next week-long project. By stamping our feet down and saying “done” we confirmed that we could adhere to our project guidelines of quickly developing and moving on. Making a game that needs extensive polish: R-evolution doesn’t “feel” very good at all – if we had two more days we could tweak it so that the animations, input, and time windows for all of that could be adjusted to the point where it just plain feels natural to move the avatars forward. It’s even more difficult when considering the combined forms, and the visual feedback needing to match how in sync/out of sync players were, for which we used a shaking effect for the avatars and making them semi-transparent. Some additional polish would be great, and we’d be a lot more comfortable with the final product, but again, we just need to move on. As a 3D game that relies so much on that one interaction to be solid, we were tackling a game that needed extensive polish in order to be even nominally acceptable by our usual standards, a game that we have no time to make. In the future we need to create games that don’t need extensive polish in order to be “just fine”. Time Management: We didn’t manage time well at all – there was a weekend crunch of 4 straight days, getting less than 5 hours a night and leaving our office around 6 AM, compacted by the fact we were all slightly ill. While doing this might be fine for a jam or once a month, it’s untenable to do this every week for the rest of the project. Meaning: The meaning of R-evolution was “competition turning into cooperation”, the ability for a group of individuals to look past their own goals and see the greater benefit of working together. The game didn’t start out with this in mind – we came up with the interaction and mechanic of racing first and foremost, and assimilated that into our meaning. The emphasis on polish and feel might have stemmed from that first thought – if we thought of the meaning first and how to convey that via gameplay, would our development process have been more centered on delivering that meaning to players rather than on feel or polish? Competitive aspect: While we snuck in a few things like making the loading screen say “Preparing for race”, immediately framing the game context into something competitive, R-evolutions doesn’t feel like a race at all. Any competitive aspects are rendered null immediately by the sense of lack in progress. There are no visual indicators of progress along the track, no GUI elements to represent it, and everyone moves at the same set speed if they’re stepping on the pad faster than the very low threshold of repeating action. This makes our initial conceit of competitors coming to a realization together very weak, changing the meaning of the game to something more akin to “lets all work together”, which is also nice, but just not what we were going for. What happened in the event was quite curious though: the first team didn’t make it, we held the suggestions until they started to lower their concentration. But we had to stop the game at some point. Really sad moment. The second team was so motivated that we had to wait until they got to a point where they were just ping-ponging among sync and non-sync state. Then one guy came to me begging to try again with his fellow companions: they wanted to win the game, at all costs. And they did it! With an amazing roaring clapping and yelling from the public. We were happy that people were able to beat it, and that it was to a triumphant end. That triumphant end was only attained after incredible difficulty, however, which was not something we wanted. It would’ve been great had the game been made so that any group of 5 strangers could communicate to one another well enough that they could band together and complete the game, but R-evolution is definitely not at that stage. We’re still very proud of how well it did in the competition, placing third out of the other finalists. Regarding our project goal of creating games that are meaningful, we’re not so sure how well we did on that front. Again, with the competitive aspect of the game being diminished so, was playing R-evolution a meaningful experience for the players? Our other projects are relying on the feedback we get from the audiences we’re finding on the internet, so on a game like R-evolution with such a limited playerbase, we are in the dark. As a stepping-off for our project, we consider R-evolution a success – we learned a lot, and hopefully can incorporate these lessons into the rest of the semester. STATTMEDIA Game Contest – 3rd place! As we mentioned before, R-evolution was a finalist in the 5 BUTTONS Competition being run by Experimental Gameplay Project. 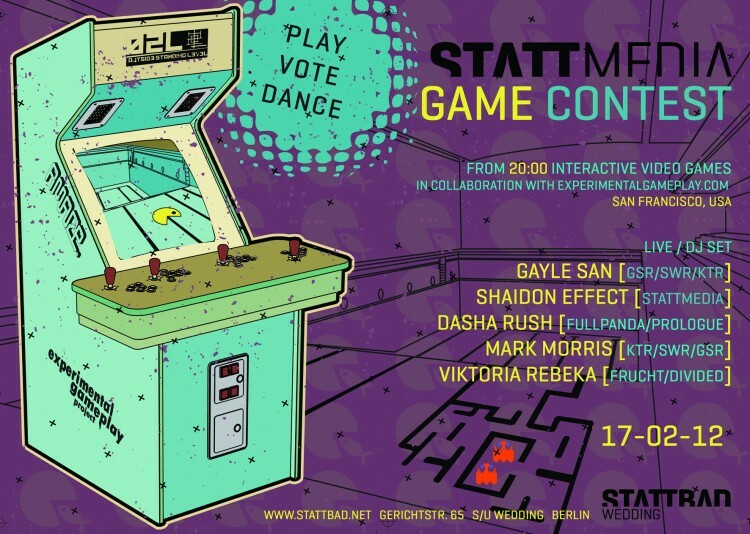 Because of that, we had the awesome opportunity to be displayed at the Stattbad Wedding gallery in Berlin for people to come play our game among all of the other finalists. As reported to us by one of the organizers, R-evolution was played in three sessions during the night. R-evolution isn’t the most, uh, friendly of games, so the first and second times it was played the players couldn’t get to the end. 🙁 But, a daring group of friends wanted to try it out, and as the third time was the charm, they finished it to “an amazing roaring clapping and yelling from the public.” So awesome! We’d like to thank all of the organizers as well as congratulate everyone else who were shown or entered – it’s incredibly thrilling to have independent games exposed to the public-at-large – shows like the STATTMEDIA event, NYU Game Center’s No Quarter, and venues like Babycastles go a long way in showing people the wide range of non-commercial and non-industry games out there, and us here at mindful xp are super happy that we could be a part of it. We should have some pictures from the event posted shortly, and also releasing R-evolution on the site, so stay tuned! Spielen Sie unsere Game in Berlin! Or is that “im Berlin”? Is using imperative mood right in this context? German class was too long ago! 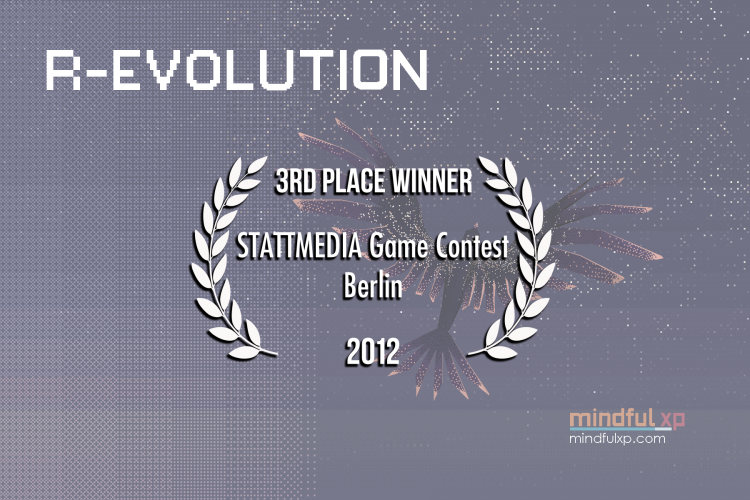 Our game R-evolution, made for the 5 BUTTONS Compo at Experimental Gameplay Project, was chosen as a finalist! That means that R-evolution will be playable in the STATTBAD Wedding gallery (inside a drained 19th century swimming pool?!) in Berlin as part of a public showing on February 17th, along with other awesome games submitted to the compo. If you’re in the Berlin area next week, go and have fun at what looks to be a killer night of games and live music, and support indie games! We’re in the IGF 2013 Student Showcase! mindful xp at Meaningful Play 2012!